Originating from the Caucasus Mountain area, the Caucasian Mountain Dog was depended upon to guard villages and flocks. They were also used by the former Soviet government to guard factories and government facilities. In the United States they have earned a reputation as trustworthy service dogs. They are also known as the Caucasian Ovtcharka. A strongly muscled, powerful, and athletic breed, the Caucasian Mountain Dog possesses a very distinctive head and expression. They are most often described as "bear-like". This ferocious defender's body is slightly longer than they are tall with males being more massive and females lighter in build. The Caucasian Mountain Dog is affectionate, demonstrative, and gentle with family members. They are highly protective of their family and territory and extremely suspicious of strangers and dogs. This breed is even-tempered, steady, and possess keen senses. Any danger, real or perceived, will result in warning growls and barking. Caucasian Mountain Dog's will not hesitate to respond with lightening-quick speed to protect what or who belongs to them. Frequent brushing is required to prevent the coat from tangles and matting. Bathing should only be done when necessary using a mild shampoo to protect the weather-resistant coat. 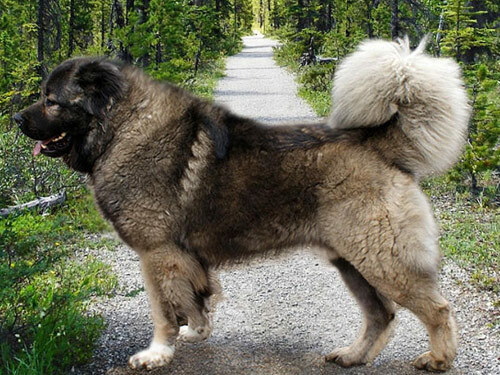 There are no known health problems associated with the Caucasian Mountain Dog breed. The Caucasian Mountain Dog has a double coat which is weather-resistant. The outer coat consists of coarse, longer guard hairs. The undercoat is soft, fine, and dense. There are three types of coats: long, medium, and short. The Caucasian Mountain Dog is slow to mature and is headstrong. Early socialization is a must. Caucasian Mountain Dog's will not respond to harsh or heavy-handed methods. Training should be done with firmness, fairness, patience, and reward. The Caucasian Mountain Dog breed is not recommended for apartment or city dwelling. They do best in a rural setting with room to roam and run and a job to do.